Preparing for a move is no small task. Cleaning the house, throwing out unwanted items, and hiring a reliable moving team can quickly become overwhelming. For many homeowners, the most daunting task is packing. Everything from valuable heirlooms to children’s playthings needs to be packed into boxes and, somehow, arrive unscathed to the new residence. When it comes to packing safely and efficiently, the question is inevitably asked: plastic bins or cardboard boxes? Everyone knows that tossing stuff into a garbage bag isn’t going to end well, but what type of moving container is best? At On The Go Moving and Storage, we know that information is key to a successful move. That’s why we have compiled a list of pros and cons of both plastic and cardboard boxes. 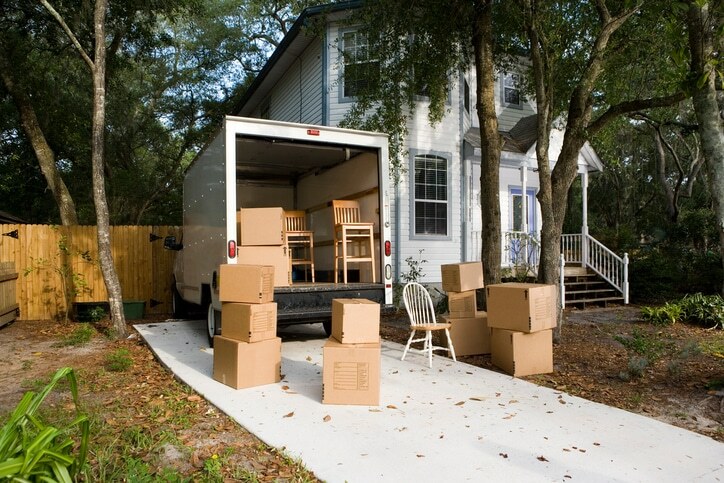 Read on to find the best way to move your belongings. On The Go Moving and Storage Can Help! One of the biggest benefits of plastic bins is that they are reusable. Cardboard can be torn or damaged by water, but plastic is durable and some bin types are completely sealed. If you plan on moving again in the near future, it may be a good idea to invest in plastic bins. Also, because they can be used again down the road, you can use them for attic or garage storage. If you don’t plan on reusing the bins, renting them can be a great option. You get the convenience of not dealing with excess boxes after unpacking, and some rental companies will even pick up the plastic bins from your new residence when you’re done with them. Another perk of plastic bins is that they are eco-friendly. Whether you’re renting or buying for later use, the bins last years, spanning multiple moves, whereas cardboard is often thrown away after a single move. Plastic bins don’t tear or break under a heavy load like cardboard, so the investment is almost always worth it. It should be noted that if you do use cardboard boxes and don’t intend to keep them, be sure to recycle. Be environmentally responsible with whatever method you use. With all that said, plastic bins do have a few downsides. One major con is that they often don’t stack well. This can be an issue during transportation when it’s vital that the storage containers remain still. Sure, the bottom of plastic bins might fit into convenient grooves on another bin’s lid, but the lid and bin shape prevent them from stacking flush against each other. This may cause them to shift in the truck, something you definitely don’t want. Another con is that plastic bin rental services aren’t always available, and if they are, there may be limits on how far you can take them. As a result, plastic bins are only practical if you’re moving locally and there’s a rental service nearby. Cardboard boxes come in all shapes and sizes. Unlike plastic bins that may not work with oddly shaped or fragile items, you can cardboard boxes in every size, depending on your needs. They’re also available nearly everywhere, making them a quick addition to your packing plan. Check on Craigslist for free or cheap used boxes. As mentioned above, plastic bins tend to be unsteady when stacked, but cardboard boxes are designed to conform perfectly to each other, allowing for safe and steady transport. Fit them snug against each other and you should have no problem with shifting during transport. An additional perk is that there are no time constraints with rental services and you can simply recycle the boxes after use. Also, if you need to ship items through the postal service, standard cardboard boxes may be your only option. Cardboard boxes cannot carry as much weight as plastic bins. Sure, they might hold steady when packing, but lifting them into the moving truck can cause them to tear. Or, if the cardboard holds, the masking tape can break and dump the box’s contents onto the ground. If you have heavy items in need of packing, be sure to consider the limits of cardboard. Cardboard boxes can collapse if you place heavy items on top. The last thing you want is a box full of belongings to get crushed. Finally, cardboard boxes require extra time and effort to set up, tape, and tear down. For those with serious time constraints, it might be worth spending the money to rent ready-to-use plastic bins. At On The Go Moving and Storage, our goal is to give you the resources to pack, transport, and unload your belongings quickly and stress-free. We firmly believe that a well-planned and well-informed move is the safest move, and we want to help you achieve the perfect moving experience. This should be an exciting time! Don’t let the hassle of packing get in the way of your big day. For more Seattle packing tips and information on how we can serve you, contact On The Go today. Our team of packing and moving professionals are ready and equipped to move your belongings carefully, efficiently, and under budget.